1 of 3 Bring a large pot of salted water to a boil. Cook pasta according to package directions, about 11 minutes. Drain, reserving 1/2 cup pasta water. Return pasta to pot. 2 of 3 While pasta is cooking, heat a large nonstick skillet over medium heat. Add onion and oregano; coat generously with nonstick cooking spray. Cover and cook, stirring occasionally, for 3 minutes. 3 of 3 Stir broth and vinegar into skillet. 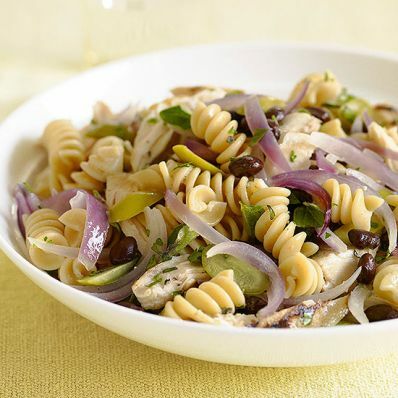 Stir in chicken, beans and olives; cook for 2 minutes or until heated through. Toss with pasta and serve, adding reserved pasta water if too dry. Per Serving: 5 g Fat, total, 40 mg chol., 0 g sat. fat, 7 g fiber, 496 mg sodium, 304 kcal cal., 25 g pro., 38 g carb.